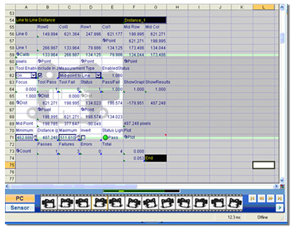 In-Sight EasyBuilder and Spreadsheets gives new or potential In‐Sight users a 4-day overview of the hardware and software used by In‐Sight Vision Systems. The class features both EasyBuilder and spreadsheet application development, and an introduction to round trip application development using the EasyBuilder® interface. EasyBuilder and spreadsheet users will learn how spreadsheet functions work and how to apply their knowledge to complete the class lab exercises. The class focuses on hands-on labs to build tool usage scenarios within sample applications. The In-Sight Spreadsheets class content is comparable to the In-Sight Standard class.